Gift Wrap is great for birthdays, anniversaries, and any other occasion that needs to be marked with lovely gifts and equally eye-catching gift wrap. American Retail Supply is stocked with rolls of gift wrap, making it easy for you to get all your gift wrapping supplies in one place. So wrap it up in style with our beautiful gift wrap, and make your gifts stand out. Donâ€™t forget to think about your overall gift wrap usage. Full Reams are 833â€™, Half Reams are 417â€™, Quarter reams of 208â€™, or a Cutter Box of 100â€™ per roll. Once you have chosen your size, we have over 2000+ gift wrap designs to choose from. American Retail Supply works with 4 high quality gift wrap manufactures that produce gift wrap that is eco-friendly, thick and some even have cutting lines on the backside of the paper for easier use. With so many of patterns to choose from, you're guaranteed to find just the right one. American Retail Supply makes shopping for gift wrap easy by breaking up your many options into categories. Double sided gift wrap is very convenient you get two patterns for the price of one. 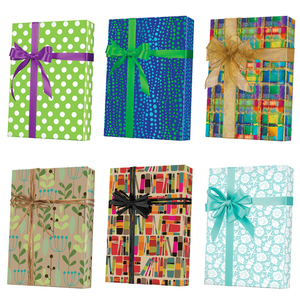 Everyday Gift Wrap are patterns that work well for any occasion. Look at our solids and metallics if you need something simple. Kids gift wrap is where you will find things like cars, zoo animals, baby and popsicles. We also offer beautiful Wedding gift wrap that will stand out. Do you offer a gift-wrapping service in your store? If not, you might want to put some thought into it. It could drive sales and take your customer service to another level. Offering a gift wrap service provides your customers with one less thing they need to worry about before heading to their destination. This small offer makes your retail store that much more memorable and shows that you value the time of your customer. Creative wrapping ideas can set your present apart. It can also show people how much you care about them and shows that you took the time to wrap their present in a unique way. Presentation is half the battle. Have you ever thought about custom gift wrap? Is your store a known location in town? If so, American Retail Supply can help you with custom gift wrap paper. Add your business logo to a roll of gift wrap paper and think of it as just another form of marketing.